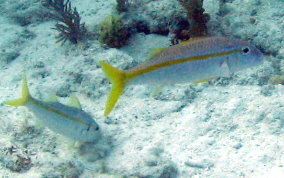 The Yellow Goatfish looks similar to the Yellowtail Snapper, with the forked, yellow tail and the midline yellow stripe, but that is where the similarity ends. The goatfish is a bottom feeder. 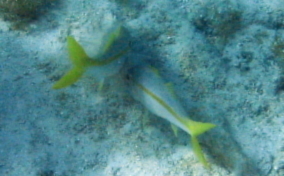 Look for the two barbels under the tip of the chin that they use to dig in the sand for food. 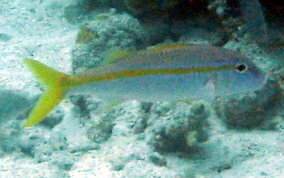 Smaller goatfish will often school together in large groups whereas the more mature goatfish will more often be seen alone or in pairs. They can often have a color cast of blue, green or red. Look for them in depths of over 5 feet. Average length of the adults is about a foot long. Most fish in the schools seen at snorkeling depths will be about 6-8 inches long.